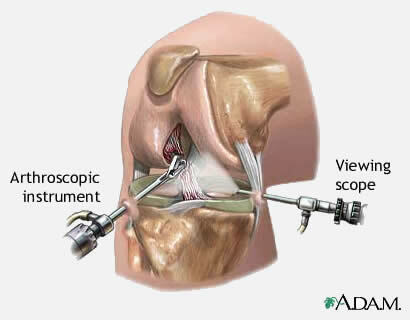 Arthroscopy literally means to look into a joint. It has revolutionised the treatment of knee injuries. Arthroscopy is now used to treat a wide range of knee conditions such as meniscal tears, ACL rupture and cartilage repair. In the past, treating these conditions would have involved large incisions, a hospital stay and a very prolonged recovery. It is usually done as a day case procedure under a general anaesthetic. The procedure involves making 2, 1cm incisions either side of the knee cap – 1 is used to insert a camera and the other is used to insert instruments to perform the surgery. More incisions may be required if the surgery is more complex. Knee arthroscopy is one of the most commonly performed orthopaedic procedures. Most surgeons can have a look around the knee and treat minor conditions. However, due to my unique training and vast arthroscopic experience, I am able to treat complex knee injuries such as articular cartilage damage, meniscal tears requiring repair and ACL tears with greater success. After the operation, the knee will be wrapped in a compression bandage and feel will feel numb to local anaesthetic which I infiltrate into the portals and inside the knee. You can fully weight bear (unless told otherwise) and will need crutches for a few days to weeks depending on the procedure. You can normally return to driving after a week and back to work in 2.